I just returned from my family’s first trip to Disney World. I was a bit nervous about finding good food options for gluten-free at Disney World. You know, delicious food—not food that leaves you feeling left out of the fun. To say I was floored by the dietary accommodations they provided is an understatement. We were wined, dined, and treated so well! Keep reading to learn more about how Disney World accommodates gluten-free and other allergies. The tips below are based on my personal experience and research. Always be sure to discuss gluten-free options with your server and ensure that your personal dietary needs are accommodated. Also, this post contains affiliate links. If you order something through one of these links I’ll earn a small commission at no extra cost to you! My full disclosure isn’t that interesting, but you can find it here. 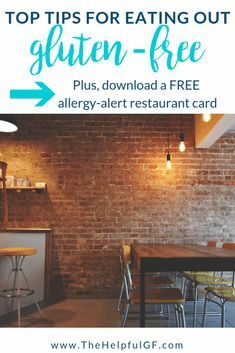 Keep reading for my experience in navigating gluten-free and allergy accommodations with all three levels for you. 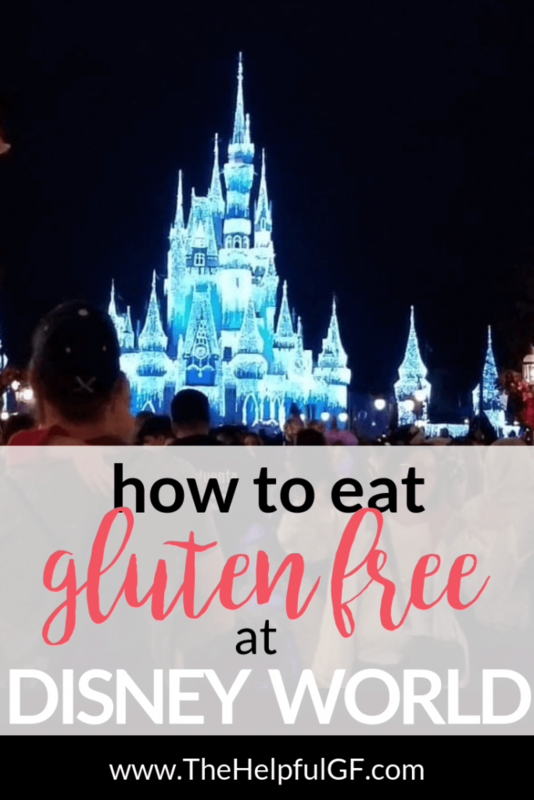 Keep reading for my full eating gluten-free at Disney World review–but also be sure to download our FREE printable restaurant card for safe gluten-free dining! It is business card sized, perfect to keep your wallet and give to restaurant staff to ensure they understand your dietary needs. Each Disney World Restaurant operates a little bit differently in how they treat gluten-free and allergies. Some will have an official “Disney World Allergy Menu” they will give you, others will bring out a chef or someone trained in special diets to go over your options. For example, when we ate at Be Our Guest in Magic Kingdom, we ordered our food with a cashier instead of at the kiosk so the cashier could discuss our options and tag specific meals as needing gluten-free accommodation. They always serve pastries at breakfast, and we were surprised that in addition to the gluten-free breakfast platter, they brought up a couple different slices of gluten-free tea breads such as banana bread. 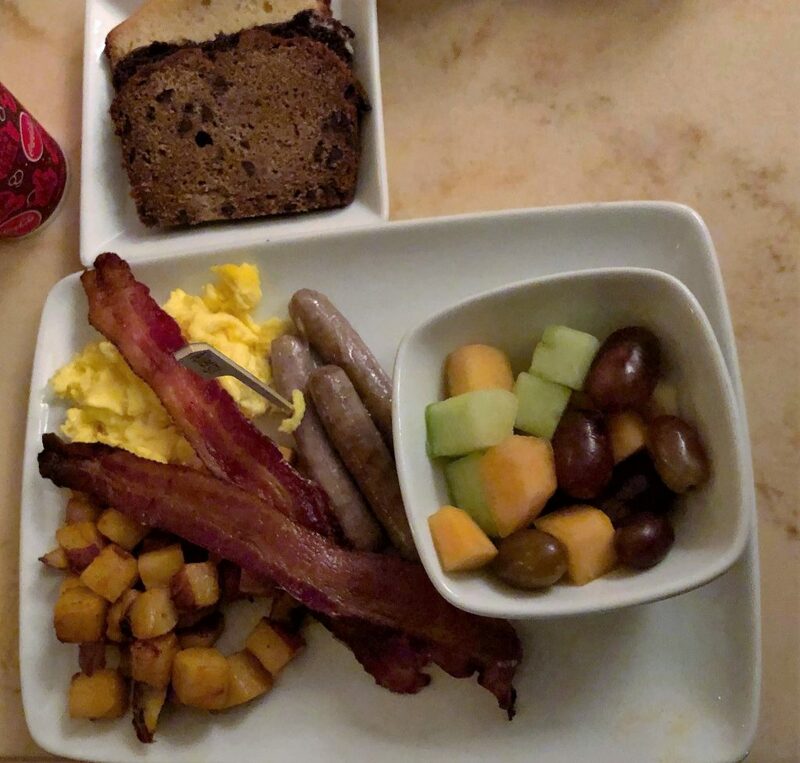 By contrast, at 1900 Park Fare at the Grand Floridian Resort, they did have a Disney World Allergy Menu detailing which options were gluten-free. Furthermore, the servers working the buffet gave us further guidance on which options were acceptable. 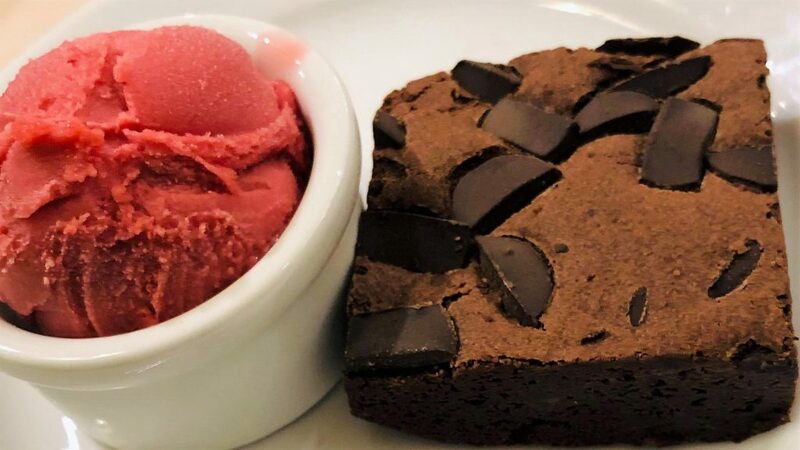 They even prepared a special dessert not on the buffet of a delicious brownie with berry sorbet and served it to our table. Whether or not the Disney World Restaurant had a specific Disney World Allergy Menu, at each restaurant, the table servers always had a receipt detailing who in our party had the allergy and which allergy it was. All of our restaurant reservations were made by Jessica, our Disney concierge. Throughout the parks and resorts there are lots of quick service options! Each quick service counter we visited either brought out a manager or special cashier to discuss options or pull up options and flag them as “gluten allergy” on the computer. For example, at the quick service counter at the Art of Animation Resort, someone specifically trained in allergies would come forward to the counter and prepare our meals. While all the quick service counters we went to had gluten-free options, some may not. However, we had a great experience with gluten-free quick service at Disney World. Plus—did you know that you can bring a reusable water bottle into the parks and the quick service restaurants will fill it up for you with ice water? We brought in our insulated reusable water bottles and Arbonne fizz sticks to stay hydrated and energized! There are a number of gluten-free snack options throughout Disney! In general, the same rules apply to getting a gluten-free or allergy friendly snack as ordering quick service. For example, at the ice cream shop we visited at Magic Kingdom, a manager came out to the cashier to specifically ensure that what I was ordering was gluten-free. Furthermore, the manager scooped the ice cream with a clean scoop from a brand-new ice cream tub to further protect against cross contamination. The manager then personally served our ice cream to us from a different section. At kiosks, the server will be able to look up the gluten-free options available at their specific stand. Many of the Disney favorites are gluten-free such as Mickey Ice Cream Bars and Dole Whip. Plus, if you’re looking for a trusted gluten-free treat, step into a Starbucks and look for easy grab and go treat labeled gluten-free (like Marshmallow Dream Bars or Kind Bars). Don’t want to spend money on snacks? You can bring your own into the park! Stash some Lara Bars or other favorite in your string backpack. Looking for other grab and go snack suggestions? Check out this post for some more suggestions. 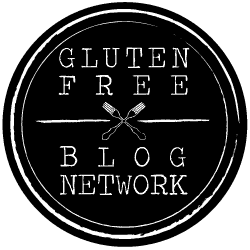 Are you interested in reading my general tips to eating out gluten-free at restaurants? Read my tips for eating gluten-free at restaurants here. Visiting a non-Disney all-inclusive resort? 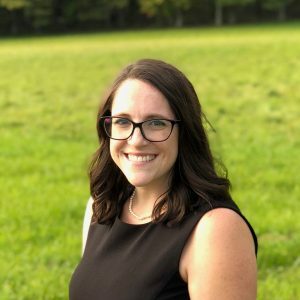 Read my top recommendations and tips here! 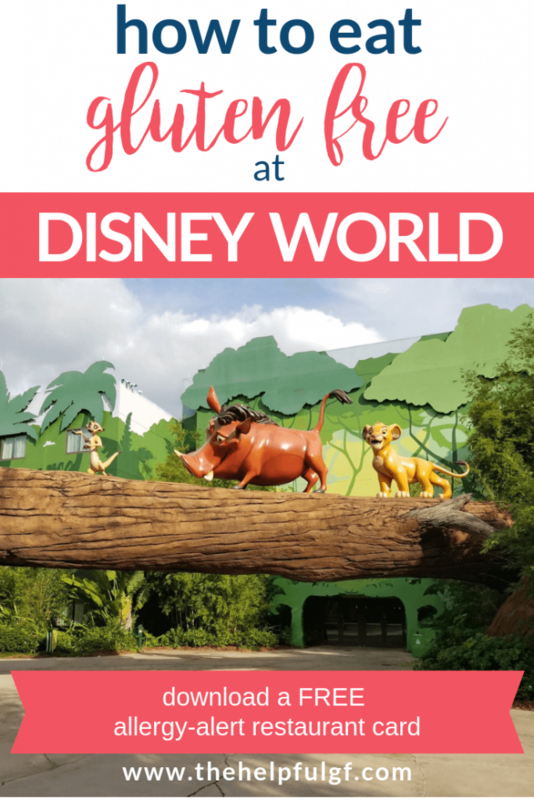 If you’re planning a trip to Disney, start getting excited about the gluten-free and allergy friendly options available to you! There are so many, and you will be treated like a princess. And don’t forget to contact Jessica and tell her I referred you. She made our whole trip totally easy. Did you love these tips? Be sure to use the social buttons below to share this post with your friends or pin it to Pinterest for quick reference later. 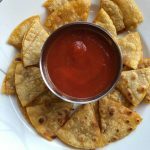 A gluten-free pizza quesadilla, or as my kids say: “pizza dippers” can be thrown together quick and is sure to be a lunch (or appetizer, or even dinner!) that everyone can enjoy! 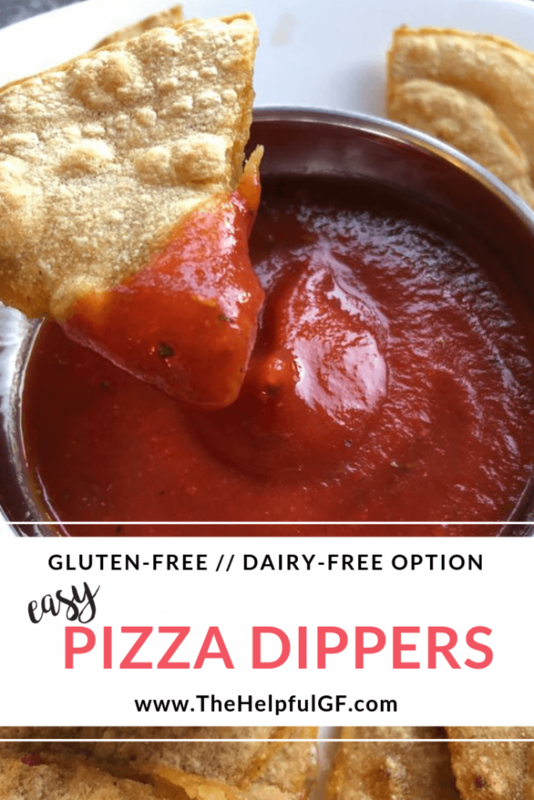 These crisp up nicely and kind of remind me of those frozen pizza bites I used to eat as a kid, but I haven’t found gluten-free version of yet. But hey—not only is my version gluten-free, but all around healthier! This recipe for a gluten-free pizza quesadilla is also super versatile. Are you also dairy free? 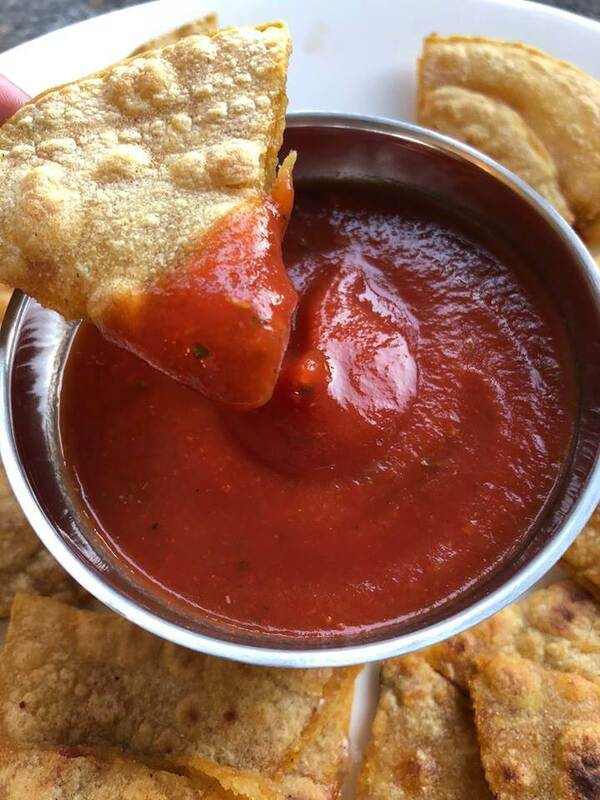 Sub the mozzarella with some vegan cheese (I use Daiya because it’s certified gluten free—learn more about gluten-free certification and labeling here). Are you a vegetarian and or don’t like pepperoni? Sub your favorite toppings like black olives or mushrooms! Can’t stomach corn? Swap out the corn tortillas for a brown rice tortilla. Modify it to fit your needs. As a mama with young kids, meals are easier when they make everyone happy. But it’s absolute necessary to have meal ideas that are quick and easy. I love experimenting with new recipes, but most of the time I come back to super simple recipes that I don’t have to think about to cook. You know—you can make it with toddlers pulling on your legs? 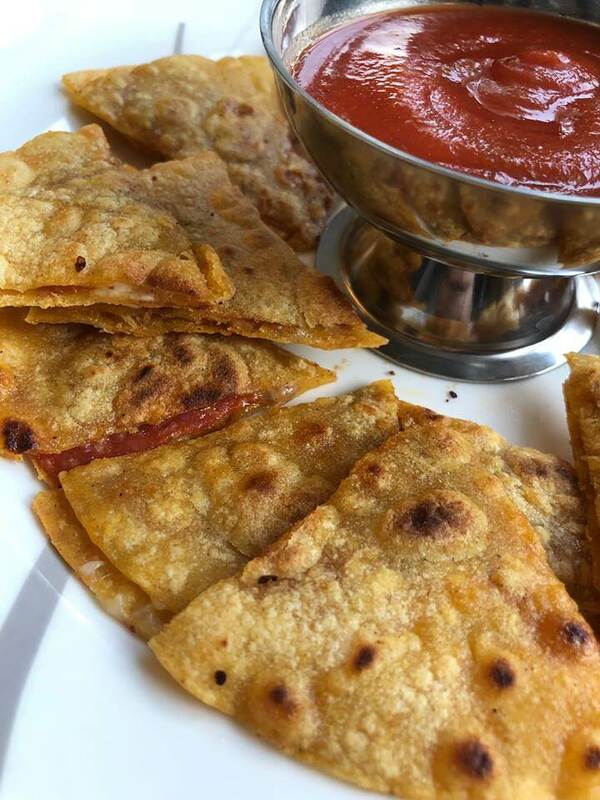 Gluten-free pizza quesadillas are one of those meals! See my other tips for getting gluten-free meals on the table quickly and easily without added stress here! Side note–there’s something about giving my kids food that can be eaten with fingers and dipped in sauce that makes them want to eat. Does anyone know what it is with kids and dip?? 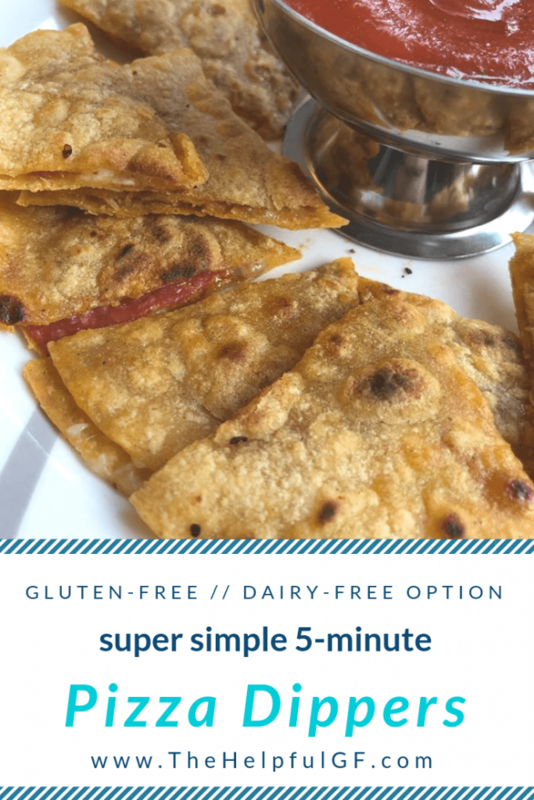 Be sure to add a gluten-free pizza quesadilla to your weekly meal plan this week and pin the recipe for quick and easy reference later! Are you ready to do gluten-free living totally STRESS-FREE? Download my FREE weekly meal plan & shopping list template and FREE instant access to my online library of free printables designed to make your gluten-free lifestyle totally easy! Once heated, spray with cooking spray and lay a tortilla on top of the pan. Sprinkle cheese, seasoning, and pepperonis on top of the tortilla. Place a lid on top of the pan so the cheese melts. It should take 1-2 minutes for the cheese to melt. Once the cheese is melted, remove the lid and place second tortilla on top. Flip quesadilla and toast the other side for 1-2 minutes so both sides can be toasted. This avocado oil spray by Chosen Foods is not only gluten-free, but avocado oil is great for high temp cooking and it doesn't contain soy or other fillers. While there are many gluten-free pepperoni products available, I love this one by Vermont Smoke and Cure. I love seasoning blends from Spiceology--they are all gluten-free and their Italian seasoning is great! Halloween can be difficult for gluten-free kids and others with food allergies and sensitivities. The Teal Pumpkin Project organized by FARE seeks to make it easy for these kids to celebrate Halloween safely! It’s easy to participate—just stock up on some non-candy Halloween treats to give away. This can either be in addition to (or instead of) regular Halloween candy. 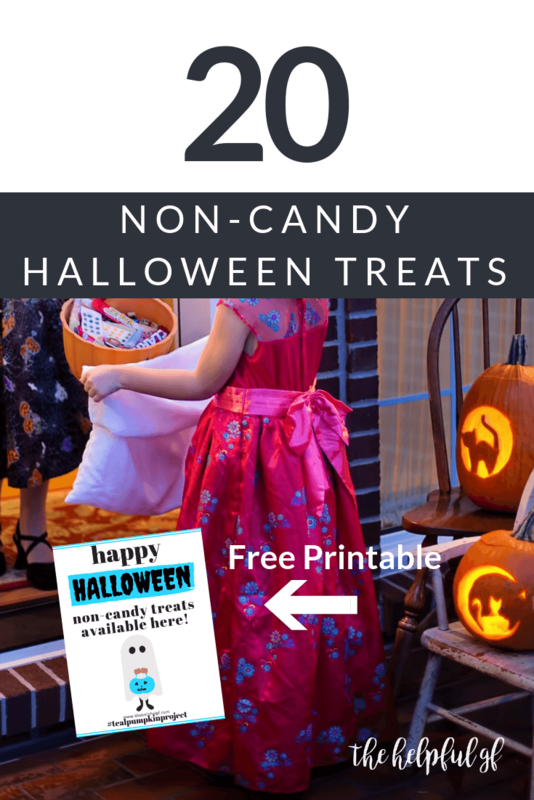 Then paint a pumpkin teal and set it out letting families with dietary restrictions know that your house is giving away non-candy Halloween treats. Or, instead of painting a pumpkin, you can also print out the FREE sign I designed and hang it up so parents know that your house is a safe choice for their kids! 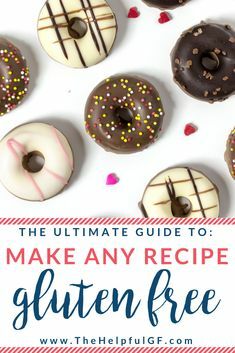 Download the free sign now and you’ll also get instant access to my online library of free printables designed to make your gluten-free lifestyle totally easy! In addition to candy, please consider stocking up on non-candy Halloween treats like these to give away. Stocking up on a few non-candy items is a small way you can make a big difference in a kids’ life. Please consider participating to make Halloween fun for kids regardless of dietary restrictions! Have you participated in Teal Pumpkin Project before? Comment below letting us know what goodies you gave away! Also–spread the word to your friends and family by sharing this post. 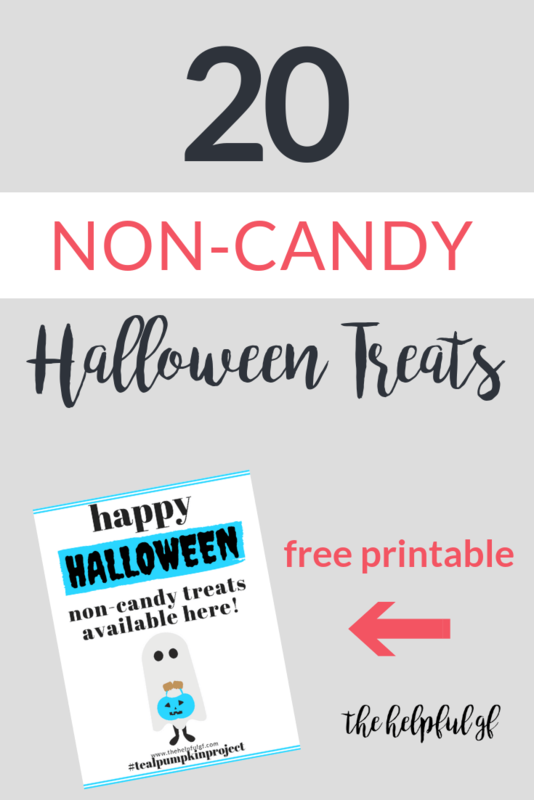 And, don’t forget to download a FREE printable sign advertising your house as one giving away non-candy Halloween treats. It’s August—which means it’s almost time for back to school. 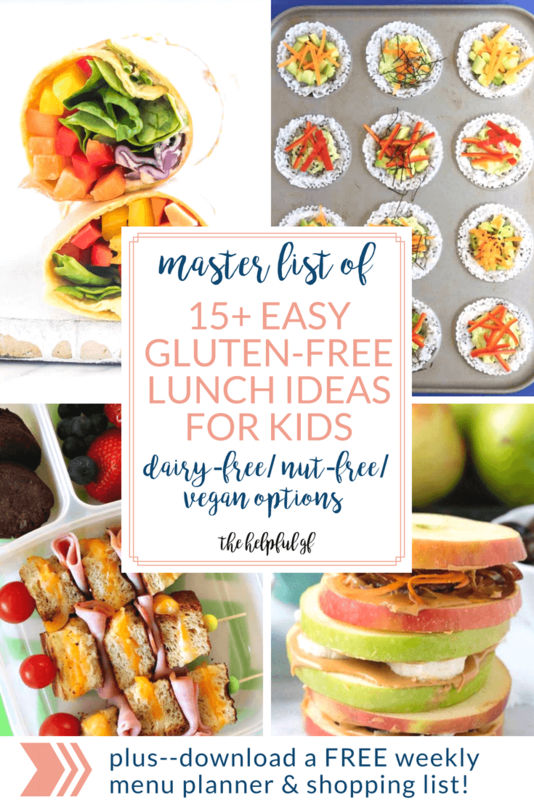 Coming up with lunch ideas for school can be challenging in general, but extra challenging when you need to come up with gluten-free lunch ideas! This is especially important if your school cafeteria does not accommodate your child’s specific gluten-free needs (not to mention adding in the complexity of needing nut-free, dairy-free, or vegan lunches). Due to this, it’s so important to plan ahead when it comes to prepping lunch for your gluten-free child. I like to make a list of the lunches I’ll pack that week (I usually pick 2 ideas a week and alternate days so they don’t get too bored with what I pack!). Then I plan it on my menu planner and shopping list. I also keep a couple fall back ideas available for when I just can’t even. You know what I mean. 😉 You can download your own weekly menu planner and shopping list here for FREE so you’re not caught off guard. Are you ready to do gluten-free living totally STRESS-FREE? Get FREE instant access to a downloadable weekly menu planner & shopping list designed to make your gluten-free lifestyle totally easy! I have a couple ideas that I use over and over for my kids—but the variety is lacking. 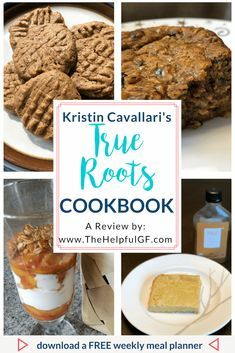 I needed some more ideas, so I reached out to some blogger friends and they shared some of their gluten-free lunch ideas. And now, I share them with you. 😊 Here’s a roundup of 15+ gluten-free lunch ideas for back to school! Main Star Gluten-Free Lunch Ideas! 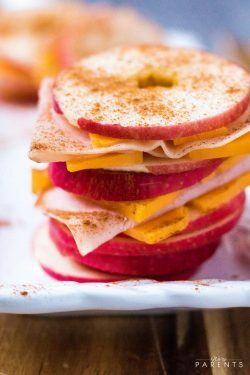 My kids aren’t huge fans of gluten-free bread (unless it’s toasted), so using apple slices as the “bread” of a sandwich is GENIUS! 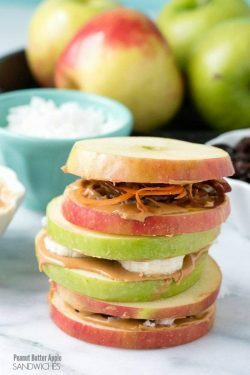 These turkey & cheese apple sandwiches by We’re Parents (number 1) and these apple peanut butter sandwiches by Boulder Locavore (number 2) have the kids wanting more. 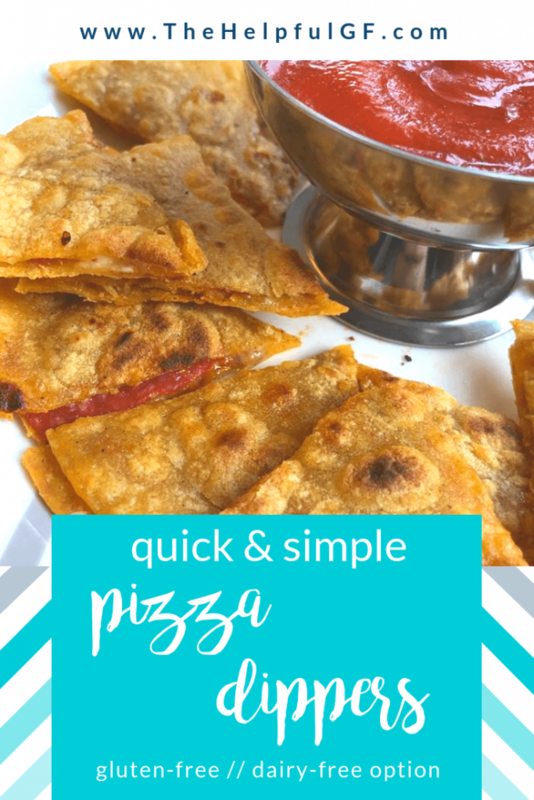 My recipe for these quesadillas with a pizza twist are easy to cook up and taste great warm or cold! Plus, you can fill them with any of your kids’ favorite pizza toppings. 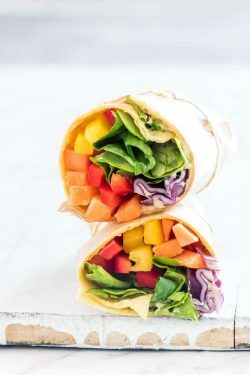 If you’re trying to help your kid eat more veggies, this vegan wrap idea by Recipes from a Pantry is a sure winner! Plus, look how pretty it is! Is your gluten-free kid a lover of world cuisine? 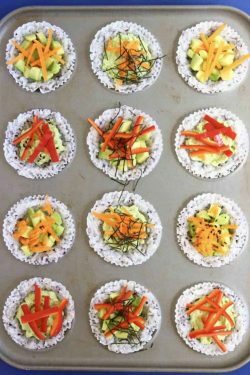 These muffin tin sushi cups by Rhian’s Recipes will be perfect! Just make sure that your soy sauce is gluten-free—or use coconut aminos. Plus—these are great to make ahead and use throughout the week. Sometimes you just need a classic lunch idea. 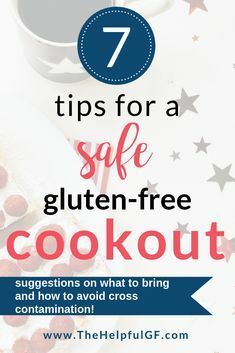 These gluten-free grilled cheese kabobs by My Gluten-Free Kitchen are not only a classic choice, but putting bite sized pieces on a kabob make them totally fun as well! Every kid loves Lunchables! 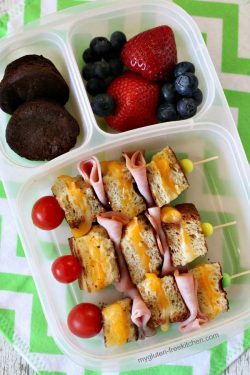 If your gluten-free kid is disappointed they don’t get Lunchables like everyone else, pack them this gluten-free copycat by Strength and Sunshine. This recipe makes 3 servings (see—prepping ahead) and the crust is not only gluten-free, but grain-free as well. (If dairy-free cheese isn’t your thing, just sub regular mozzarella and any toppings you wish). My girls LOVE noodles—they are so fun to eat! 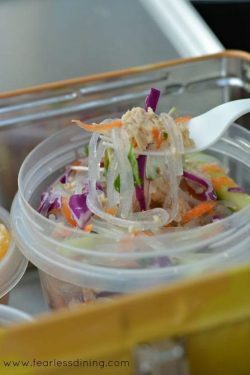 This Asian tuna vermicelli noodle salad by Fearless Dining is one of those lunches that kids find fun to eat. This recipe makes 4 servings—and you’ll find yourself packing it for lunch too! 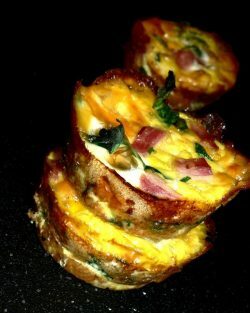 If your child has access to a microwave to heat up their lunch, pack them these ham & egg cups by Easy Low Carb Recipes. They are packed with protein and have veggies for an extra health punch! This is another make-ahead option for easy prep. Just make sure your cooking spray is gluten-free! My favorite is this one by Chosen Foods. Every kid loves pizza. 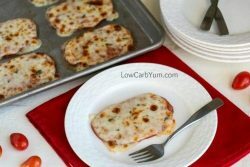 This crustless pizza by Low Carb Yum is another great protein-filled option for kids who can heat their lunches. This is another one of the gluten-free lunch ideas that you can prep ahead of time for the coming week! 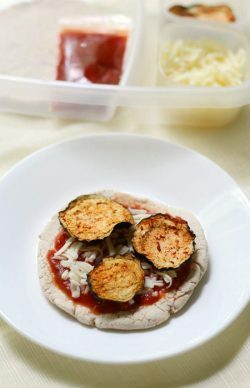 If your kid has access to a microwave at lunch, keep a couple of these hidden in the pantry for those times when you just couldn’t get your planning together for gluten-free lunch ideas. These will save you! 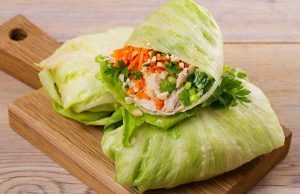 These portable lettuce wraps by Kiss my Keto are simple and easy to make ahead. Plus, the cauliflower makes for the perfect ‘hidden veggie’ for kids. Meal Booster Gluten-Free Lunch Ideas! These gluten-free lunch ideas are great additions to pack as a snack, add in as a side, or could totally be the star for a younger or light eater. This is one of my kids’ favorite lunches. I cut up some cheese, add some gluten-free pepperoni (I like Applegate Farms), and some gluten-free crackers. Easy peasy! You could do this with other lunch meats as well for a gluten-free kind of Lunchable. This is another fallback idea for my kids. They love to make a parfait of yogurt, fruit, and granola in their lunch. I pack it all separate and they love to add the fruit and granola to their yogurt at lunch time. Just make sure that your granola is certified gluten-free! Learn more about gluten-free certification and what it means here! I actually really love this Paleo granola because it has low sugar levels and doesn’t contain oats and other grains. Thrive Market makes a bunch of Paleo granola flavors as well: the pumpkin pie one is totally one of our favorites! Click here to learn more about Thrive Market, get a free trial, and to save 25% off our first order. My kids love muffins and they love bananas. 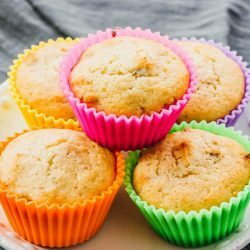 These keto banana bread muffins by Savory Tooth are a slam dunk for them! Make sure you include a pat of butter. Plus, since these are made out of almond flour, they have a good amount of protein and won’t cause a sugar crash! 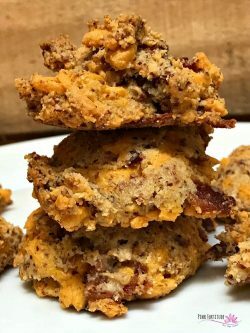 These cheddar bacon biscuits by Pink Fortitude will keep your child full! Plus, since the recipe makes a large batch of 20 biscuits I’d freeze some for last-minute lunches. 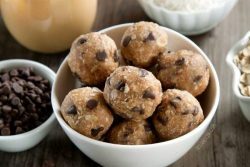 These peanut butter protein balls by Texanerin Baking may taste like dessert—but are truly a healthy addition to lunch! Just make sure to use purity protocol oats like these to ensure against the cross-contamination often present in oats. Here are some of my favorite sides to add in with these gluten-free lunch ideas! 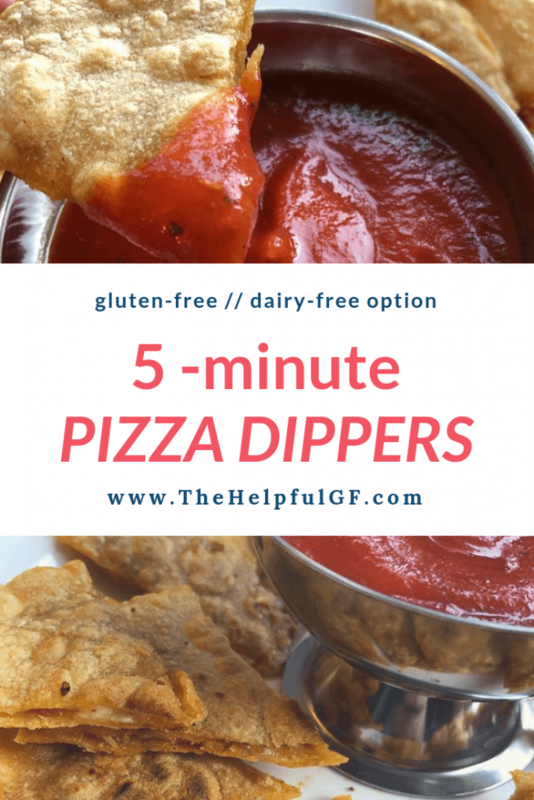 Bonus: click here for my roundup of 11 favorite gluten-free snack ideas! Do you have another favorite gluten-free lunch idea? Comment below and share it with us. And don’t forget—download your FREE weekly menu planner and shopping list below so you are always prepared with your favorite gluten-free lunch ideas!